The post Wondering, “Why Does My Dog Have Diarrhea?” Get the Answers by Stephanie Osmanski appeared first on Dogster. Copying over entire articles infringes on copyright laws. You may not be aware of it, but all of these articles were assigned, contracted and paid for, so they aren’t considered public domain. However, we appreciate that you like the article and would love it if you continued sharing just the first paragraph of an article, then linking out to the rest of the piece on Dogster.com. When a dog has diarrhea, it’s never a good day — for both the dog and his guardian. One feels uncomfortable and the other, well, has to clean it up. Wondering, “Why does my dog have diarrhea?” Well, we’ve all been there at one time or another and while it’s never a fun situation, there are some things we can do as pet owners to better understand our puppers’ pain and also alleviate their symptoms as much as possible. Why does my dog have diarrhea? An overview. 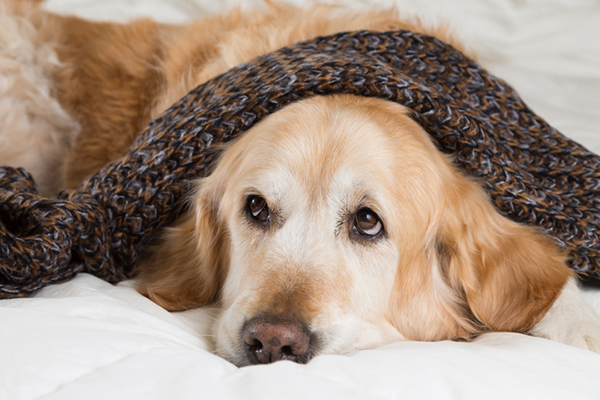 Let’s get some answers to the question, “Why does my dog have diarrhea?” Photography ©fotoedu | Thinkstock. Dogs can get diarrhea for many different reasons. Acute diarrhea is often the result of a specific cause and usually resolves itself in a few days, while chronic diarrhea often is not triggered by something specific and does not usually resolve itself. Both types of diarrhea are indicators of irritation in either the large or small intestine. In some cases, the presence of additional symptoms, like vomiting, might indicate a more severe issue. Why does my dog have diarrhea? A few possible causes. Now, what are the specific answers to the question, “Why does my dog have diarrhea?” Diarrhea in dogs is actually fairly common, and causes of diarrhea can range from the harmless — like introducing a new diet — to the severe — like an infectious disease or disorder. The key to determining whether your doggo’s diarrhea is a cause for concern lies in monitoring your pupper’s daily poops. “Intestinal parasites and dietary indiscretion are two common causes of diarrhea,” says Dr. Nold. But those aren’t the only reasons why a dog could suddenly come down with a stinky bout of diarrhea. “There are many other possible causes of diarrhea including stress, sudden changes in diet, infections (such as canine parvovirus), endocrine disorders (such as hypoadrenocorticism or Addison’s), inflammatory bowel disease (IBD) or even some types of cancer,” Dr. Nold adds. Toxicity, metabolic disease, and even certain medications have also been known to cause diarrhea in dogs as well. When is dog diarrhea cause for concern? Now that we’ve answered “Why does my dog have diarrhea?” let’s talk about what to do for a dog with diarrhea. Because reasons behind dog diarrhea span varying levels of severity, it might be difficult for pet owners to know when the symptoms are something to be concerned about. According to Dr. Ernie Ward, DVM, author and founder of Association of Pet Obesity Prevention, color and consistency are really significant when it comes to assessing the severity of a dog’s diarrhea. In short, if diarrhea resolves on its own, then typically a dog does not require a vet visit. However, if the diarrhea is super stinky, has black flecks in it, is recurrent, persistent or progressive, then take your dog to the vet! How to treat dog diarrhea — at home or see a vet? In fact, adding canned pumpkin to a dog’s food bowl can help get puppy’s gastrointestinal issues back on track. But it has to be the real deal — pure canned pumpkin — not the sugary pumpkin-pie stuff; pure canned pumpkin provides dietary fiber. Boiled white chicken is another “bland diet” staple that veterinarians often recommend for dogs suffering from diarrhea. White rice, bananas, white potato, applesauce and peppermint are other cooling foods recommended for dogs dealing with gastrointestinal issues. What dogs need to see the vet ASAP when it comes to diarrhea? Diet aside, Dr. Nold believes smaller dogs might need more immediate veterinary care. Additionally, dogs that are being monitored or treated for chronic issues should also visit the veterinarian if they experience diarrhea. “If your dog has a chronic condition they are being treated/monitored for, your veterinarian should be contacted to help determine if the diarrhea could be related to the condition or the treatment for the condition,” Dr. Nold says. Thumbnail: Photography © tverkhovinets | iStock / Getty Images Plus.